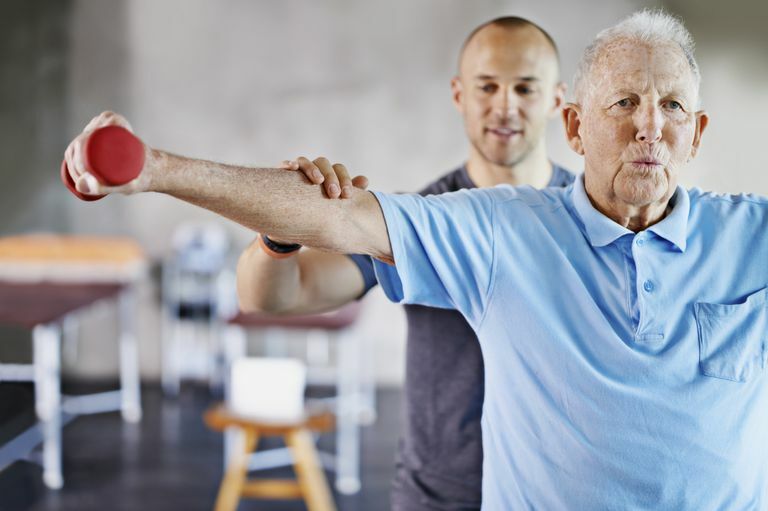 If you or a loved one is admitted to a skilled nursing facility (SNF), there is a good chance you will quickly become acquainted with the rehabilitation department, among which is occupational therapy. Many people arrive at an SNF because they no longer require the level of care given at a hospital but are unable to go home. You may still need daily access to skilled nursing services (such as monitoring the healing of a wound or assistance with medication), daily rehabilitation services, or some combination of both. Your doctor remains the ultimate overseer of your care, but nursing and rehabilitation workers are who you will see most frequently. Medicare certifies skilled nursing facilities; therefore, Medicare regulations and reimbursement play a significant role in how facilities are run. In some cases, you will stay in your same hospital room but switch to an SNF level of care. Medicare certifies some small rural hospitals (known as critical access hospitals) to provide SNF level care under the status of Swing Bed when geographical access to a step-down rehab facility is limited. Even though you are staying in the same location, you should notice a change in the care you are receiving. Occupational therapists have a holistic view of health. They are trained to assess and intervene in health factors (like strength, range of motion, mobility, cognition, motor planning, etc.) but ultimately are interested in how these factors are impacting your ability to perform the tasks that you need and want to be doing (known as “occupations”). For clients in a skilled nursing facility, these tasks are often the minimum activities required to return to the home setting or lesser level of care. What is required for a person to be discharged safely from an SNF varies. For example, if you live alone in a two-story home, the essential tasks that you must be able to perform to return home will be different from someone who is returning to an assisted living environment. Of importance to all patients, though, is a group of tasks called Basic Activities of Daily Living (ADLs). These are the essential tasks that patients must have a plan to perform in order to thrive. ADLs include dressing, bathing, eating, grooming, and mobility. Instrumental Activities of Daily Living (IADLs) are tasks that are also essential to one's quality of life but tend to be more complex and are easier to delegate to other caregivers. When appropriate, your occupational therapist (OT) will also assess and provide treatment related to IADLs. In order to make your transition from an SNF as efficient as possible, OTs may also recommend and provide training in modifying your environment and equipment you can use for performing daily tasks. You may have received occupational therapy in the hospital setting, but your transfer to a skilled nursing facility will start a new episode of care. Your occupational therapist will have an order from the doctor to conduct an updated evaluation. This plan of care will then be sent to the doctor for approval. Your treatments must be related to your goals and fall within the plan of care. For example, if you begin to have difficulty with your wheelchair, it is within an OTs domain of practice to address this, but if wheelchair management wasn’t in the original plan of care, she would need to update the plan of care and get approval from the doctor before proceeding. An occupational therapist or certified occupational therapy assistant can perform treatments. Occupational therapy aides may be on hand to help with the process but cannot deliver skilled treatments. Your OT treatments will likely be some combination of practicing the skills you will need to go home and addressing the physical, cognitive, emotional health factors that make these essential tasks difficult. For example, one session may focus on upper body strengthening in preparation for utilizing a transfer bench to access your shower at home. In another session, your OT may set up a mock bathroom situation and train you on the safest way to use a transfer bench. Occupational therapists graduate from OT school as entry-level generalists. But, even a new grad should be well educated and prepared on assisting you in meeting your ADL and iADL goals. Over the course of their career, many OTs will go on to specialize in certain treatment techniques and areas of practice. SNFs may seek to staff OTs with specialized training and certification. The qualifications for different levels of coverage through Medicare can be complex and are worth discussing in detail with your hospital discharge team and SNF admissions team. To give you a general understanding of how Medicare covers occupational therapy services, you will find below some of the main components of the two levels of Medicare coverage. The lingo can be daunting but hang in there, because these details are directly related to advocating for the best care. If you have a three-day hospital stay and your doctor decides that you will continue to need skilled care, you may qualify for Medicare Part A.
Medicare Part A extends for the first 100 days in an SNF and has a special set of requirements. Part of the requirements is that the staff at the facility completes the Minimum Data Set (MDS). As part of the MDS, the number of occupational therapy minutes will be combined with physical and speech therapy’s to establish a Resource Utilization Group (RUG) level. This RUG level will impact the amount Medicare will reimburse the facility. This level is set within three days of the fifth, 14th, 30th, 60th, and 90th days of a patient’s stay at the sub-acute facility. The level will determine the amount the facility is paid until the next review day. Ultra High: at least 720 minutes. Minimum 2 therapy disciplines (physical, occupational or speech therapy); one at least five days. Very High: at least 500 minutes. Minimum 1 discipline five days. High: at least 325 minutes. Minimum 1 discipline five days. Medium: at least 150 minutes. Minimum five days. Low: at least 45 minutes. Minimum three days. Medicare Part B covers occupational therapy in an SNF if you do not qualify for Part A or if those benefits have been exhausted. Therapy is then billed using a completely different system and set of codes. Occupational therapists strive to be client-centered in their goal setting. But, as this 2006 research study highlights, there can easily be a disconnect between the therapist’s goals and the client’s goals. The article suggests patients actively participate in the discussion about the goals they find to be meaningful and purposeful. If you are in a situation where you don’t know the exact goals your OT is working for, do not hesitate to ask your occupational therapist! You can also request to see your occupational therapy documentation. Navigating how much therapy you or your loved one will benefit from week to week is one of the most critical parts of getting the most of your SNF experience. A 2005 study demonstrates that higher therapy intensity was associated with a shorter length of stay and a greater likelihood of improving in ADL performance. That being said, skilled nursing facilities have come under scrutiny (and lawsuits) for providing intensive therapy to patients for reimbursement reasons versus client need. The tiered reimbursement system of RUG levels outlined above presents the following problem: if you receive 499 minutes of therapy, your RUG Level is High, but if you receive 500 minutes of therapy your RUG level is very high and Medicare reimbursement increases. Facilities, therefore, have an incentive to pressure therapists to provide that extra minute of therapy…even when the patient may not be benefiting from it. If you believe you or a loved one is receiving fraudulent services, speak with your facility, or you can contact Medicare directly. OTs receive a base level of training in OT school but go onto to receive continuing education and further training throughout their career. Each OT you encounter will have different strengths and choose different areas for continuing education. The best way to learn about your OTs unique qualifications and the reasons for the treatment they are performing is to ask questions. Here is a guide to get the conversation rolling. Another common challenge to receiving the best SNF care is simply getting all parties, both family members, and facility staff, on the same page. If you find that lack of communication or difficulty settling on the best course of action has become problematic, consider speaking to your care team about a family meeting. Many facilities will offer the option to schedule a time to get as many invested parties in the same room at the same time to talk about the best course of action. This option can bring clarity to patients, loved ones, and staff. Jette, D. U., Warren, R. L., & Wirtalla, C. (2005). The relation between therapy intensity and outcomes of rehabilitation in skilled nursing facilities. Archives of Physical Medicine and Rehabilitation, 86, 373–379. Maitra, K. K. & Erway, F. (2006). Perception of client-centered practice in occupational therapists and their clients. American Journal of Occupational Therapy, 60(3):298-310. doi: 10.5014/ajot.60.3.298.